A casement window has a hinged sash that swings in or out like a door. Crank-style or lever-style handles are used to open the sash. An additional handle locks the sash in the closed position. The handle mechanism on casement windows is easy to operate and is usually located low on the window, making the casement window an ideal window to place above cabinets, countertops, or places that are slightly more difficult to reach. Casements are appealing both in new contemporary homes and in older style Prairie and Tudor homes. 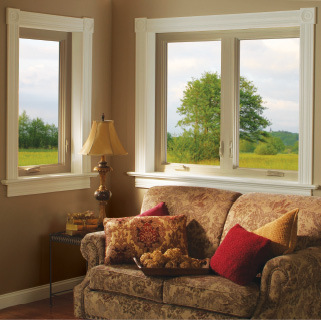 Like other styles of windows, the casement window can be installed as a single unit, or grouped together. Minimal air infiltration: Premium Vinyl Windows’ casement windows have specially designed air barriers and weather stripping, making them one of the best windows on the market to minimize air infiltration. Single-lever multiple-point locking handle: The unique design of this handle allows you to lock multiple points along the sash and frame with just one handle. Easy cleaning: Our casement windows open to a full 90° for easy cleaning of both sides of the glass. Screen hardware: New invisible retention hardware system eliminates unsightly screen clips used on traditional casements. Energy efficient glass packages: No matter what your energy efficiency needs are, Premium Vinyl Windows' glass packages can meet them. Slim-line handles: Some Premium Vinyl Windows offer a sleek fold-down handle design for the aesthetically conscious customer. This handle is robust in strength, is low profile, and is guaranteed to last a lifetime.